A new iPad app was announced by Autodesk at AU this week. This time, it’s a conceptual design application called FormIt. The app reminds me of SketchUp in that you can edit forms through direct manipulation and by sketching lines to divide surfaces, thus creating new extrusions. This interaction feels pretty fluid and intuitive. I was up and running with some conceptual forms within minutes. There are numerous aspects of this app that set it apart from other mobile design tools. First, FormIt gives you pretty reasonable dimensional accuracy and feedback as you place, move, and edit forms. You can even use a direct measurement tool. Another really cool feature is the ability to define a target gross area for your proposed design. As you build up a form, the app gives you feedback in the upper left of the screen, as to how the form is achieving the area. You set some options such as typical floor height and the app automatically adds levels as the form gets taller, thus calculating the gross area. You can also locate the proposed form on a site using a connection to Apple Maps (I think). From there, you can simulate shadows directly in the app. 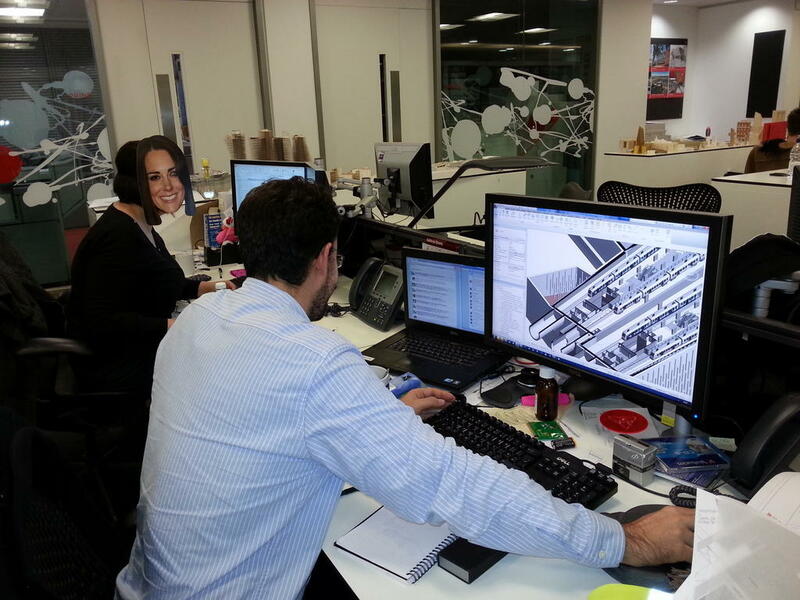 The model can then be transferred to Vasari or Revit for further development or analysis. A colleague recently asked me to add something to the 'Revit wish list' - the ability to place a section reference in a legend view. This would be used in the context of a door or window legend to indicate typical details. One answer might be to create a fake section mark as a generic annotation, but we really don't want to go down that rabbit hole...a better solution must exist. 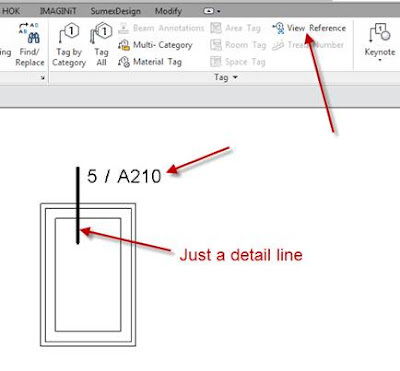 I remembered reading about the enhancements to view references in Revit 2013. View references are usually used in plans to divide large floor plates into smaller part plans in order to fit on a sheet. In 2013, they can be used on many other view types - including legends. To create a view reference in a legend view, find the Tag panel in the Annotate tab of the ribbon. Click on View Reference. In the figure below, I am using the default view reference family and I simply drew a detail line to indicate the section cut plane in the legend view. When you start the View Reference command, you will need to select the view you wish to reference. In the contextual ribbon, use the View Type drop-down to filter for a particular type of view, such as Sections. Then select a view from the Target View drop-down. You can always create a custom view reference family to meet your graphic standards, but at least the view number and sheet will always be coordinated - as long as you choose the correct view to reference! Thanks to those who joined us today on our first ever Tweetup celebrating HOK's BIM Day - which from now on will be buildingSMART Day. You can still check out the tweets using #HOKBIMDay and a few new tweets on #HOKbuildingSMART. HOK's BIM leaders will be conducting a live Twitter chat on Tuesday November 13 from 12-1 pm EST in (belated) celebration of our firm's "BIM Day." We are entering a new phase of our innovative approach to design and delivery and we are now broadening our perspective to buildingSMART. The chat will be led by James Vandezande (@jvandezande) and Brok Howard (@brokhoward). Please join the conversation by following #HOKBIMDay. You can even submit your questions in advance to HOK via @HOKnetwork. Read more about this important day on the Life at HOK blog.